These days, more and more people are opting for the convenience of online shopping. Who can blame them us? With the worsening traffic situation, it is indeed easier to buy things with just a few mouse clicks than having to face battle in the streets of the metro. As if that factor is not convincing enough, the people behind ShopBack has made online shopping even more enticing! Yes. As in get cash back every time you shop! Each time you shop in any of the 300+ participating stores in ShopBack, you earn a percentage of it back. Once you’ve earned enough, you can have it deposited to your bank account or transferred to your PayPal account. I couldn’t contain my excitement so I’ve tried it out for myself. Click on any store through ShopBack and get redirected to the store’s website. Shop as usual on store’s site and make a purchase. 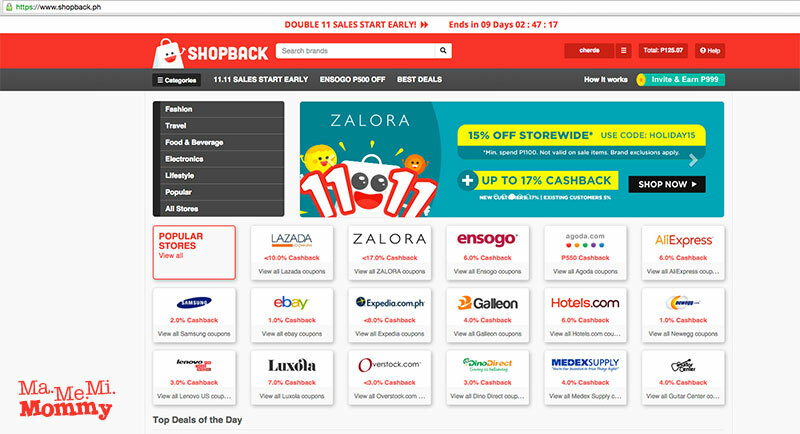 Get cashback in your ShopBack within 48 hours. This is the main page of the site. From it, you can already start choosing which shop to go to or you can shop by category. 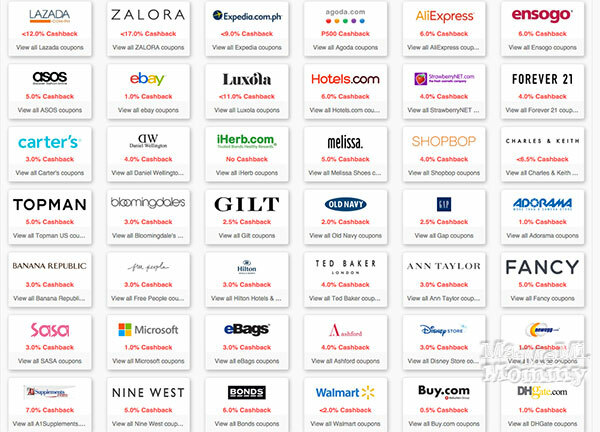 Click here to see which popular merchants offer cashback! Here are some of the participating stores available through ShopBack. 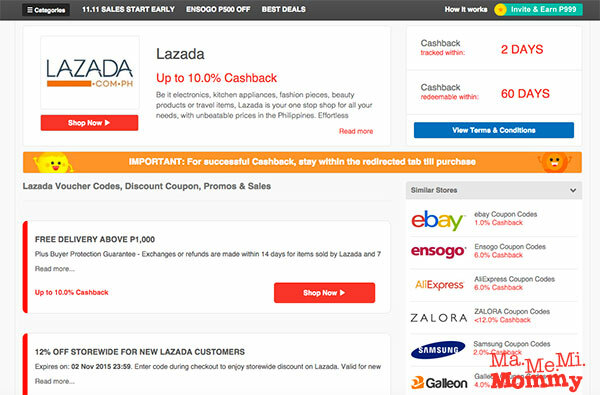 I tried out the first shop, Lazada, as it offers up to 10% cashback. I’ve been meaning to get a new set of sheets for our sofa bed. Clicking the store name brought me to another page that detailed how much cashback I can get from it. Through it, there is a Shop Now button that I clicked to go to the actual merchant site. Note: Be sure to go to ShopBack as the first step and not go directly to the merchant site to be able to earn your cashback! 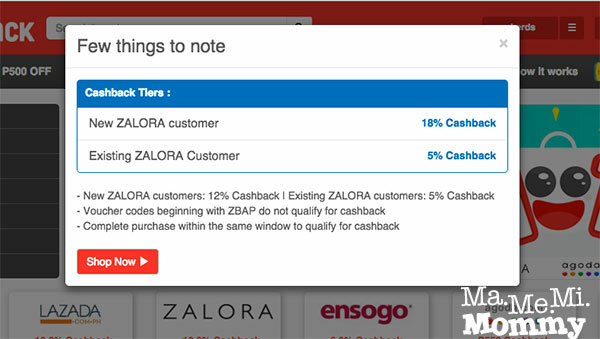 The cashback amount sometimes differs for new and existing customers, as it is with Zalora. I did find a nice Paul Frank type of bed sheet set that was on sale in Lazada and went ahead and finished the purchase. After receiving all the necessary email confirmations about my purchase, I checked back with ShopBack to see if the transaction was reflected. Sure enough, upon checking my cashback summary from the main menu, there is was, P25.07. It was reflected under Pending as it will take up to 48 hours to update it. 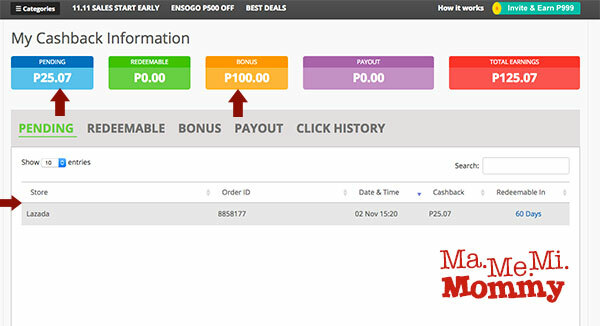 From the above page, you can also see that I already have a bonus of P100. Sign up here to get your own starting bonus! It’s really that simple! It’s earning extra shopping money just by shopping! P.S. The online stores are all having a big big sale this November, a countdown to 11.11. Earn those shopping money now while savings are big big big! Another money saving site to try and experience! The timing is perfect for the season of gift giving. Gotta try this one before the big big sale! Thanks for sharing! Mommy Queenelizabeth recently posted…When in Batangas: Orbits’ Pizza, Pasta and the Monster Burger! I heard about Shopback this past few days but your post is the most helpful for me. I will definitely give a try shopping through this online shop. Thanks for posting this. I’ve learned about ShopBack few months ago and it is nice to know that they have more stores now compared sa dati na konti pa lang. Will try this during the Lazada Online Revolution para mas makamura pa heheh. I’ve been hearing good feed backs about shopback. I think it’s now time to try shopping here. Usually I buy from Lazada or Ensogo. With Christmas coming up, I really should check this out! 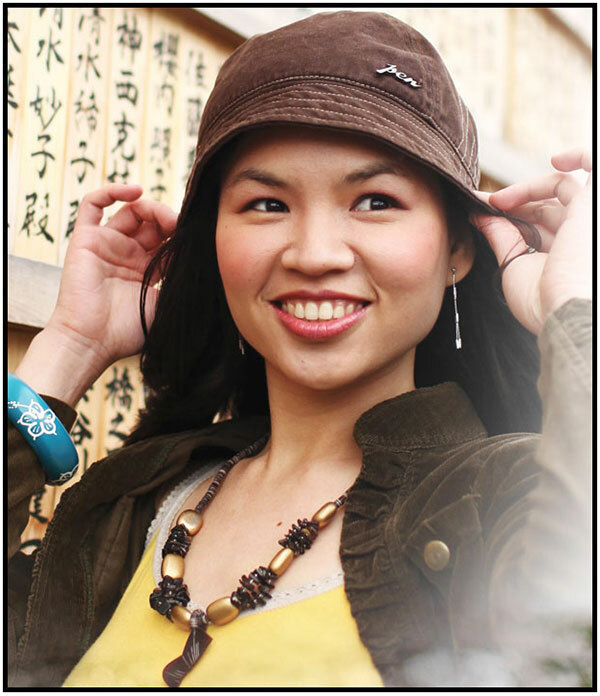 Rowena Wendy Lei recently posted…Holiday Gift Ideas: Disney Baby! I’ve seen lots of bloggers promoting this. I’ll check this out too for some Christmas Shopping. Ooh, sounds like a great concept, especially that online shopping is a “thing” now, because of traffic and lots of people at malls.. thanks for sharing this, will check it out! Earning while shopping is cool! Gotta check out this website for my Christmas shopping. Thanks! Maria Teresa Figuerres recently posted…A Mouth-Watering Tapa Festival at GoodAh!!! Together with Yuletide on the agenda, I truly must check this out!Generating though shopping can be cool! Gotta look at this amazing site for my Holiday shopping. Cheers!